Windows 10 is designed for mobile devices. All apps are background apps, by default. If that’s useful for anyone, great, but I have yet to meet that person. That’s like the early days of Windows, when most services were turned on, by default. It was a security and performance disaster, and subsequent versions of Windows have used more reasonable defaults, until now. Mostly, Windows 10 is running on desktops and notebooks, and there is a long list of apps pre-installed by Microsoft. Some may be added by the hardware manufacturer, and they run in the background, be default. Maybe that’s a good idea if the app is working for you, providing emergency weather alerts, calendar alarms, stock alerts, anything. But all of them? Just say no. If you don’t allow these apps to run in the background, they will still run when you start them in the usual way. 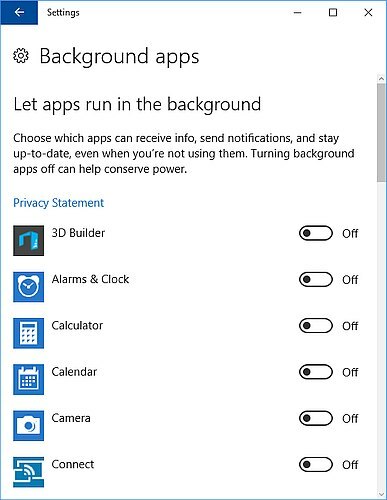 To turn off these apps, click Start, Settings, type ‘run’ in the Search box, and choose the result ‘Choose which apps can run in the background’. I’ve seen from 16 to over 30 apps listed, all turned on, and none of them are needed to run Windows 10. Turn off most of them–leave them on only if you want them to do something, like gathering alerts. Our business PC user newsletter is monthly, mostly, with short computer news for business owners.